We come to your house (or workplace if you'd prefer) and can fix the dent for you while you wait. Most jobs typically take less than an hour to complete. As we use paintless dent removal techniques we don't need a lot of space. We can repair your car on your driveway or where its parked on the road or in a car park, we just need to be able to access the panel that the dent is on. We use metal bars and rods to massage out the dent from the inside so we never leave a mess and there is no filler or painting work. Car Dents have been repairing cars for customers in Hampshire and West Sussex for over 20 years, and have a great reputation in the area. Most of our work comes from personal recommendations. 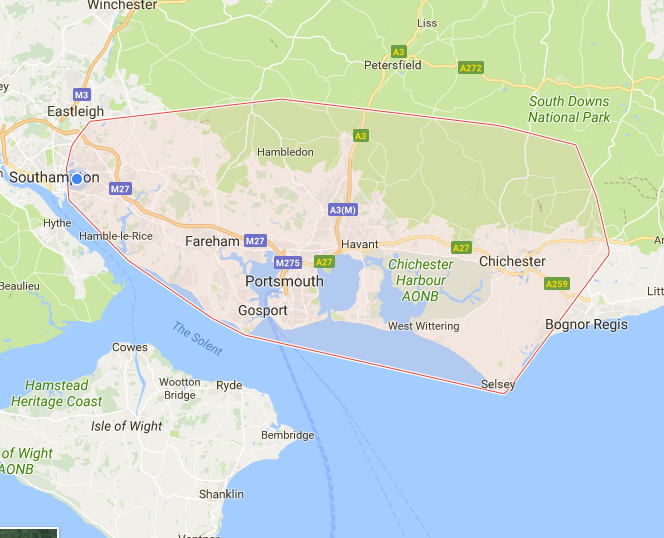 If you are located in Southampton (Woolston, Bitterne, Hedge End, West End, Netley, Hamble, Botley ) or Fareham, Portsmouth, Gosport, Lee-on-the- Solent, Porchester, Cosham, Waterlooville, Havant, Hayling Island, Emsworth or Chichester then we can come to your home or workplace to repair your car dents. How soon can I book in? Get in touch with us and we can let you know if your dent is suitable for a PDR repair and how much it will cost. If you'd like us to repair the dent we can usually get you booked in within a couple of days. If the repair is urgent please let us know as there are some instances where we can get to you the same day.